Its already assumed by many within the Michigan Republican party that Governor Rick Snyder will essentially cruise to a win over a scandal ridden Schauer campaign. We have had a different take on it; essentially arguing ANYONE could beat Schauer, so why not have a robust primary on the GOP side? Alas, as there are few who wish to spend money fighting both the candidate, AND risk being on the outs in the GOP in the future, we are relegated to the squishy liberal incumbent. Someone HAS taken a cue from the weakness of the establishment in the supporting organization however. When challenger Todd Courser came within a couple dozen votes to oust sitting MiGOP chair Bobby Schostak in a prior convention, it sent a message that a shakeup is in the works. By the time the Mackinac Republican Leadership Conference had happened, no challenger had yet appeared to depose Snyder, but a contender willing to stand before Republican Delegates in 2014 and challenge Sitting Lt Governor Brian Calley had made it clear he was in it to the end. Wes Nakagiri announced his candidacy, and the Snyder Calley folks took him seriously. So much so, that a reserved reception room for a planned Wes Nakagiri function on the island became mysteriously ‘unavailable’ at the last minute, resulting in the ‘Yes-Wes’ group to find alternative accommodations with only hours to do so. Now Nakagiri is getting some in-your-face tools to use to point out that he is not only credible, but probable as an agent of change in the MiGOP political machine. His campaign has released a statement of a significant win in ‘Calley friendly’ territory. In the first straw poll of 2014, challenger Wes Nakagiri defeated incumbent Brian Calley by a margin of 52 to 48%. 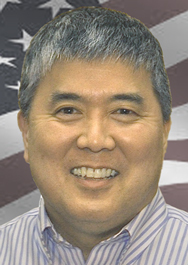 Nakagiri, a conservative activist from Hartland, Michigan is seeking to become the Republican nominee for the office of Lieutenant Governor. In other districts where Snyder/Calley are less popular, would the results be even more pronounced? While a straw poll is hardly an absolute indicator of support, it DOES have some merit in such a politically volatile environment. This is one race which is starting to wake up. I've known Wes since he became active. If nothing else, he's organized. He has a plan. He knows what he's doing. I think Wes has a shot IF the tea party groups unite. As of now, I don't see that happening. Too much of a split between "alliance" factions and what I'll call the "Courser" factions for lack of a better word. Right now, both sides are looking at the precinct delegate positions. That's the voting pool. I've been called by both sides. For the record, I'm staying neutral. My stance is that I'm backing the hardest working candidate unless I get targeted for defeat as a precinct delegate (then all bets are off). There's things I like and dislike that I've seen from both camps, but that's usual for me. To be perfectly honest, I'm not sold on Wes, at least not yet. And I know enough about polling (far more than my critics give me credit for) to know that a straw poll is, by its very nature, unreliable.
. . . and the degree to which Mr. Nakagiri convinces me he can carry that checklist is the degree to which he can convince me to vote for him. However, I have more immediate concerns than how I'm going to vote on this question at the State Convention. Until after the filing deadline, this one isn't going to be much more than a side-burner item for me. And I fully agree with Dan, in that until the various factions of the constitutionalist insurgency can quit biting each other's arses, the better-organized establishment will win every time. On a couple of those points perhaps. While legislative experience from a procedural point of view might be useful, there are a number of them who are still dumb as rocks even after a full complement of terms. And frankly, if someone is smart enough to run the State Senate, but dumb enough to promote liberty stealing plans like mandated insurance parameters, then they are still not needed.